Stop me when you’ve heard this one. 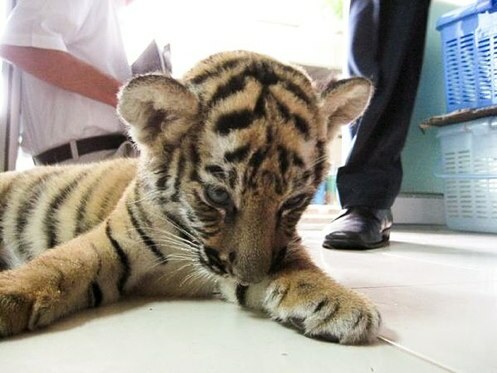 A Thai national is trying to smuggle a two-month old tiger cub to Iran, so she drugs the cute little buggers and tosses them into a carry on bag filled with stuffed tigers so as to throw off security. You hadn’t heard it? Okay, well now you have. Cottonwood, Arizona locals hanging out at Chaparral Bar had their evening rudely interrupted by an unwelcome whisker clad intruder. As you can see from the bizarre security camera footage above, the cat attacked and injured two patrons. We bet the guys hanging out at the bar have never been so freaked out by a cat fight before. Some fled, some jumped up on stools and tables and some grabbed pool sticks to defend themselves in what must have been quite a scene. The cat knows how to make an entrance, we’ll give it that. This wasn’t the bobcat’s first stop on its night out on the town. A woman phoned police from a Pizza Hut after she was scratched by the animal and when police got a second call around 11 pm informing them that an underage felid was wreaking havoc down at The Chaparral, they caught up with the beast in the parking lot, where they shot and killed it. Let this be a warning to all Bobcats who want to go out for dinner and drinks: steer clear of Cottonwood, Arizona. You are currently browsing the archives for the Big Cats category.